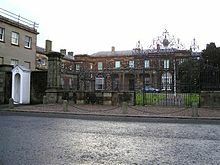 Hillsborough (population 2400) is a village located in central County Down in Northern Ireland. Off the A1, 4 miles south of Lisburn, the closest rail station and place for bus connections. 54.462031-6.0840541 Hillside Bar & Restaurant, 21 Main St, ☎ +44 28 9268 2765. 54.461427-6.0842822 No33 Coach House, 33 Main St, ☎ +44 7713 622074. This city travel guide to Hillsborough is a usable article. It has information on how to get there and on restaurants and hotels. An adventurous person could use this article, but please feel free to improve it by editing the page. This travel guide page was last edited at 09:53, on 13 January 2019 by Wikivoyage user Traveler100bot. Based on work by Wikivoyage users AlasdairW, Wrh2Bot, AndreeBot, Traveler100, The Anome, Nicholasjf21, The Anomebot2 and LtPowers, Wikivoyage anonymous user 82.203.3.2 and others.